Don't try to measure yourself - ask a friend to help. Take all measurements twice - mistakes do happen. 1. Across Back: Across the back from sleeve to sleeve. 2. 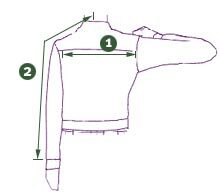 Neck to Sleeve: With the arm held out straight. From the centre of the neck to the end of the (fastened) cuff.